Before the current one, the Eighties were perhaps the last Golden Age of coiffeured cycling. As yet free from the encumbrance of enclosed-helmeted racing but with sufficient money and exposure coming into the sport to encourage a greater degree of flair amongst the peloton, both rider kits and rider cuts got louder and flashier. Rider power was on the rise and, as with football, the bubble perms, quiffs and mullets first found their way into favour with the Western European riders and then – usually a good decade later – with the Eastern European ones. Commercial interests started to take greater priority and looking recognisably different from everyone else was seen to be a useful attribute – both off the bike and on it. In cycling there can be few more frightening things for members of a breakaway than looking over your shoulder and seeing a massive Dutchman leading the arrowhead of a raging peloton back up to you at incredible speed. All pro-riders of every era will know this fear. But when it’s 1985 and that Dutch guy is sporting a vast ‘euro-redneck’ mullet the panic bar is raised a few significant notches. Gert-Jan Theunisse terrorised the pack with his uncompromising riding style and his equally nerve-shedding hairstyles. I know people who still shiver at the mention of Gert-Jan’s name and the hair is a big part of that. Indeed only 1997 World Champion Laurent Brochard’s mullet was of greater proportions but it lacked the same fear factor. When paired with the infamous Castorama ‘dungaree’s’ kit, Monsieur Brochard took on more of the look of a harmless medieval village idiot rather than Theunisse’s ‘Aguirre-Wrath of God’-like character, who appeared much more likely to be lurking somewhere out in the dark forest beyond. Since then only Vladimir Karpets has come close to Theunisse’s mulleted magnificence. The Nineties brought a new ruthlessness to pro-cycling: after the bald-pated wins of Riis and Pantani, the close-cropped buzz-cut of Lance Armstrong spoke volumes about the new approach. Substance (and substances) triumphed over style. Especially hair styles. Win at any cost became the order of the day and hair suffered as the current contenders decided to stop at nothing and mainly go for short, close and dull. To be fair, the riders would also have to contend with the added heat of the helmet. Cycling helmets had been around for a longtime (and Lemond’s wearing of a boxy Giro one in the ’89 time trials was a contributory factor for my preference for Fignon) but their mandatory usage from 2003 after Fabio Casartelli’s death in 1996 made short hair preferable and big statement styles seemingly impossible. It was a grim time indeed which only seemed to get worse with the new millennium. Michael Rasmussen’s grade 1 skinhead of 2007 was akin to a bell tolling for the death of the cycling hairdo. It wasn’t always so bad. Some riders in the Fifties carried combs in their jersey pockets to ensure their wind-strewn locks could be tamed into something more respectable for the podium cameras. In a time of still images – before the prolonged suffering of the day was broadcast to fans but whilst cyclists were still appearing in the many photo magazines – the sense of self was perhaps more acute. At least they were in the grand tours when summer sun often blessed the stages. The Spring classics remained resolutely mud-plastered and beyond the rescue of a simple comb. Chief amongst the comb-carriers was the Swiss rider Hugo Koblet. Already famous for his pre-podium preening, the 1951 Tour winner (nicknamed the Pedaleur du Charme) obviously considered himself an aesthete and somewhat above less cultured members of the peloton. In the decisive stage of 1951, when Koblet destroyed the will of his rivals with a 140km solo break, he still had a sufficient time gap to comb his hair before crossing the line. His antics brought him a deal for a comb endorsement worth 7 million lire. Along with Fausto Coppi, Koblet brought a new sense of sophistication to the peloton that continued into the Sixties. At that time the French master time-triallist Jacques Anquetil showed a similarly dispassionate approach to racing as Koblet and his never-less-than perfect pomade somehow sums up the ice-cold, metronomic dispatching of his adversaries as he became the first man to win the Tour de France five times. The Seventies should have been a good time for the hair of the cog but as with the racing it was pretty much dominated by one man. Eddy Merckx may have had many rivals such as Roger de Vlaeminck and Luis Ocana but neither The Gypsy’s meaty sideburns nor The Spaniard of Mont-de-Morsan’s luscious black bouffant could match Merckx’s mighty marriage of the two. His jet black hair, styled in the image of Elvis, and generous lamb-chops showed that, as usual, The Cannibal had it all and everyone else was vying for the minor places. Back in those days the Tour had it’s own barber and riders could get a quick cut in the village depart before the stage began. I’m sure Monsieur Le Coiffeur was more than competent but conjuring a mental image of him brings back memories of the lonely barber at the end of my student house road in Oxford. Old, small, with a neat “Mr Fussy” moustache, Dennis wore a dark blue housecoat every day and, where other hairdressers might have pictures of current pop or TV stars on the wall showing off the latest styles for customers to choose from, Dennis had a picture of the then Archbishop of Canterbury. I’d like to think that the Tour de France barber also tried to tempt the shaggy-haired behemoths of the day with pictures of Octave Lapize and Lucien Petit-Breton. After the lean years of the Nineties and Noughties when we only had Mario Cippollini’s Lion’s Mane to distract us, we are finally seeing a resurgence in hair styling in the pro-peloton. It could be suggested that Bradley Wiggins’ mod style feather cut and eye-catching sideburns (and the interest they generated on both sides of La Manche) kickstarted this latest nouvelle vague but that would be a disservice to the styles that been cultivated since before Wiggo’s sideys featured in the British tabloid newspaper The Sun as a cut-out-and-wear souvenir of his 2012 triumph. Sir Brad’s style is far too retro to trickle down through to the youngsters of the pro-ranks and he was generally shorn of most of it during actual racing before abandoning it completely for his disastrous 2013 campaign. It’s the guys who race all year with their signature styles intact that we wish to celebrate here and if we are looking for the instigator of the renaissance we need to borrow a phrase from the 1986 film ‘Highlander’ and declare that there “can only be one”. 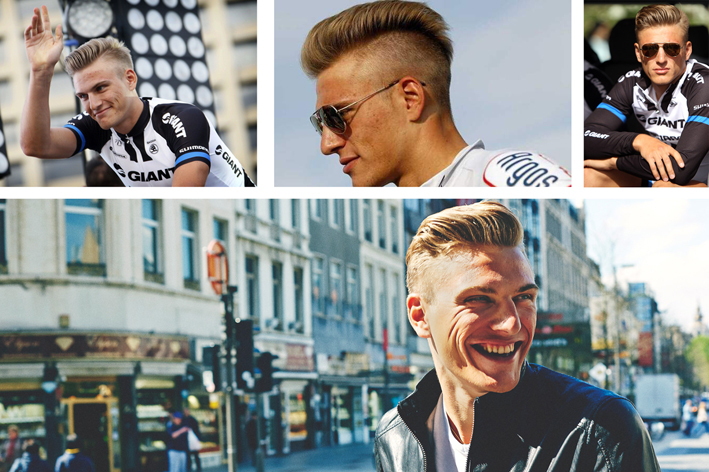 The true saviour of the cyclist’s hairstyle is, of course, Herr (Hair) Marcel Kittel. Whilst everyone is seemingly agreed that Kittel’s hair is a classical work of art that should be universally marvelled over, other prominent riders are offering more avant garde hairstyles that challenge the observer’s notions of follicle form and function. Taylor Phinney’s forehead pile-up is the most challenging of all. The old adage that it looks like he has been pulled through a hedge backwards could come into play here but only if the hedge were of a corkscrew shape, and it diminished in size as the lanky American is hauled through it. Whilst I admire it’s uniqueness and daring, I’m constantly reminded of the unfortunate hero of the excellent children’s book “The Story of the Little Mole Who Knew It Was None of His Business” who spends the entire story trying to work out which sort of farm animal has left a rather large, coiled turd on the top of his head. (Click here to see a video.) I do like Phinney, both as a rider and as the genuinely engaged, caring person he appears to be but it is not enough to soothe my mesmerised creeping horror when I see him bare-headed. The way he has been working back from a very serious recent injury has also been exemplary but the sooner he gets back to racing (and gets his hair back under a cap or a helmet) the better for everyone I think. And then we have the curious case of the mysterious re-greening of Alejandro Valverde’s previously exposed valley tops. In a comeback almost as strong as his post doping ban riding, Alejandro’s hair seems to becoming thicker each season, prompting intermittent debate about whether the Movistar man has ‘done a Museeuw’ and had a hair transplant. Perhaps Valverde is hoping for a bit of late career success in the cobbled classics. Multiple Paris Roubaix winners Museeuw and de Vlaeminck have both had hair transplants in their later years – Roger promotes a hair treatment clinic in Belgium. With reports coming out of the recent Arctic Race of Norway that Thor Hushovd has also re-thatched his straw coloured roof the trend seems destined to continue.. Valverde is out of contract at the end of the season and likely to move teams. A ‘transplant’ to the German Alpecin team would be a long shot but the hair-restoring shampoo company have a long association with sponsoring cycling – even running a fairly dubious “Doping for the Hair” marketing strapline for a number of years – and the team-up would appear to be a match made in hair-heaven. Talking of which; here are a couple of fantasy cycling teams (picked by Daniel and myself from current pro team rosters) based on their barnets alone. The big question is: Who would win in a ‘head to head’? Taylor Phinney – BMC. A very pretty (slightly poopy) pile-up. Michael ‘Bling’ Matthews – Orica Greenedge. An epic construction of ‘Strictly Ballroom’ proportions. And the nickname to match. Elia Viviani – Cannondale. How sprinter Viviani reaches the speeds he does with an air-brake as big as that sheer cliff of a quiff atop his head remains a mystery to physicists the world over. Alex Howes – Garmin Sharp. Hipster quiff extraordinaire. Loft, angle, attitude: it’s got everything. Thomas Lofkvist – IAM Cycling The 6th Backstreet Boy or just Christian Bale’s double during the off season? Linus Gerdemann – MTN Quebeka. A Beckham lookalike during his early years, Gerdemann failed to get a contract last year but is now making a welcome return to the top ranks. Giovanni Visconti – Movistar. The Ronaldo-esque moulding is spiced up with a cheeky bit of eyebrow shaving. Michael Valgren Andersen – Tinkof Saxobank. Wonderfully wierd blonde Bieber/Bowie/Walken-esque androgony. Jakob Fuglsang – Astana. The boy takes his hair so seriously he sculpts his eyebrows. Rigoberto Uran – OPQS. The purity of a no-nonsense mullet remains a thing of great awe. Peter Sagan – Cannondale. Horticultural shagginess a la Wolverine. Often dyed green in July. Martin & Peter Velits – OPQS & BMC. Old school Slovakians still proudly rocking a Scorpions look. Pippo Pozzato – Lampre Merida. Day to day it’s just a loose perm par excellence but Pippo has also shown some real hair derring-do before with cornrows..
Daniel Oss – BMC. A heavy-metal kid on ‘The Final Countdown’ towards achieving a massive Joey Tempest hair-fest. Oscar Gatto – Cannondale. “The Walnut Whip”. Guillame Boivin – Cannondale. Another young lad with hair as big as his future. This time it’s such an epic quiff that looks almost surfable. Fabio Felline – Trek Factory Racing. Fab by name, Fab by hair. Perm-tastic. It has to be noted that Italians and Americans are making up a pretty large percentage of those riders, with Cannondale being the single biggest provider. BMC and Garmin also have multiple entrants, which leads to the suspicion that institutionalised hair-enhancing might be going on at a team level in some reaches of the pro-peloton. It might also explain why Garmin trialled those ridiculous POC time-trial helmets earlier in the year. Maybe they were designed for hair-o gains, not aero gains. They had to be big enough and wide enough to accommodate any number of styles without damaging them. And why not? Feel good about your hair and you feel good about yourself. Feel good about yourself and you perform better. It’s simple marginal gains stuff. Just remember, you hair’d it here first. origin: mid 19th century: from rhyming slang for barnet fair, the name of a famous horse fair held at Barnet, Herts. This entry was posted in Pro cycling, Style and tagged bmc, Bradley Wiggins, Cycling, de vlaeminck, eddy merckx, fignon, giant shimano, hair, hushovd, jacques anquetil, kittel, MATTHEWS, OPQS, orica greenedge, phinney, Pro cycling, procycling, Robert Millar, team sky, viviani, wiggins. Bookmark the permalink. Might not win, but could be good for a few stage victories.